Through one of my clients – Fuentek – I get to work with NASA scientists and engineers. I mean, these guys really are rocket scientists! How cool is that. I learn about technology they develop, then help them understand how (or if) the intellectual property should be marketed. Many times we only assess and advise NASA, but often I'm asked to find licensing opportunities. Sometimes when you're educating prospects you need more than printed words to tell a convincing story. Consider the power of proof that pictures, slides, audio, & video can add to just words. Electron Beam Free Form Fabrication (EBF3) is a technology that was jointly developed by NASA's Langley Research Center and Johnson Space Center. 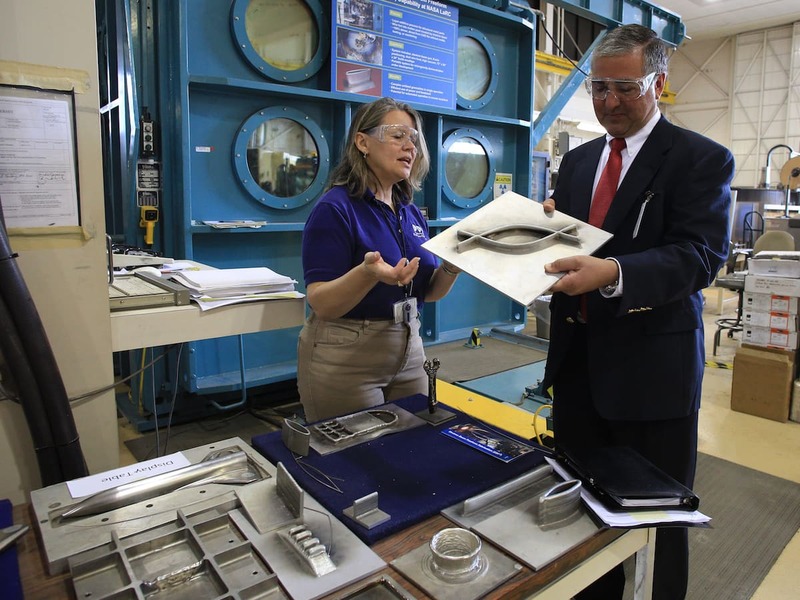 Some day this manufacturing process will allow space travelers to make any new or replacement part on demand. Here is the article about it from the Fuentek blog. To help potential licensees understand the EBF3 story, I worked with the key scientist at NASA Langley to create a presentation. The technology is very complex but our slides explained it in a very simple way. Providing a prosepct with a link to the presentation (9.3MB PDF) is simple, but as you can see when you click the link there are some drawbacks (time to load, screen size, ...). A better option might be to post the slides to a social media site like Slideshare, then embed a player on your site. This has two advantages. First, viewing the presentation becomes simpler and more flexible. Second, Slideshare does an awesome job of Search Engine Optimization (SEO) to get your slides ranked higher with search engines. Cool huh? A slide deck can enhance written copy by giving your prospect some visual images to look at as they read. Using an embedded slide viewer instead of a linking to a file also keeps your learner more focused since they remain on the same page. Pictures can only tell a part of the story. To really bring a story to life you need audio. Sound can give a story context, location, and even passion. So I decided to interview Karen Taminger, the research scientist at NASA Langley who I worked with on developing the presentation. I used Skype and called Karen on her office telephone (using SkypeOut). She had a rough script I'd given her, we visited, and I just recorded her as she talked to each slide. Then I edited the recording, added an introduction, exit, some location sounds, a music loop in the background, and compressed it into a final audio file. Nice. With video you can deliver 24-30 pictures every second. This makes it ideal for product demonstrations and explanations. Here's a brief, but very effective video for a project I worked on with NASA's Ames Research Center. So for EBF3, I took the same slide images and dropped them in my favorite video editor (ScreenFlow from Telestream). Then I added the audio, output the video, then posted it to YouTube. Super simple. Judge the difference. What do you think works better, just words or having a NASA engineer give you a guided tour? Printed words tell a story - and a picture is worth a thousand words. But if you really want to bring a story to life, audio and video are hard to beat.